Some people find themselves really despising any kind of gimmicks, while others might not even recognize them. There are also some people who recognize that gimmicks are useful in some ways, but that doesn’t mean they personally enjoy them. 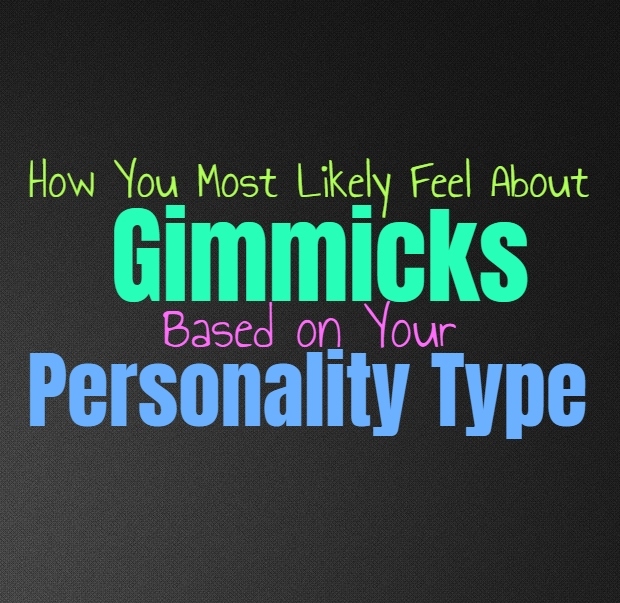 Here is how you feel about gimmicks, based on your personality type. INFJs are usually bothered by most gimmicks and find them to be cheesy and shady. They don’t like the way so many people and places try and force others to purchase something by using their gimmicks. They often recognize these right away and become deeply annoyed by them. They don’t like anything which feels insincere and like they are being tricked by someone. For the INFJ most gimmicks are obnoxious and leave them with a bad taste in their mouth. They can appreciate when business need to find ways to draw people in, but they prefer when this is done in a more honest manner. ENFJs definitely don’t appreciate the use of most gimmicks and can easily recognize them. They become annoyed with anything which tries to talk down to them or assumes they are stupid. ENFJs are very aware of these types of things and can recognize insincerity fairly quickly. They notice just about everything gimmick they see, and most of the time this leaves them with a distaste for the people using them. They understand smaller gimmicks are used to draw in attention and sometimes they are okay with this, but most of the time they prefer marketing tools which are more sincere. INFPs don’t enjoy gimmicks when they notice them, since this feels like a ploy. They do sometimes miss when something is a gimmick, especially when it is presented very subtly. While INFPs are aware and skeptical people, certain gimmicks and their flash can be entertaining to them and so they don’t really notice that they are simply in place for sales reasons. Most of the time INFPs can be annoyed by sales pitches and ploys used to make people buy into whatever they are pushing, especially when it comes from a completely insincere place. ENFPs definitely recognize most gimmicks, and can become rather annoyed by them. Most of the time they are aware of these things around them since ENFPs are naturally observant people. The only time they might not recognize a gimmick is when they are emotionally invested in something and personally become very excited about what they see. Sometimes their emotions can be the things which gets in their way, and so they might buy into something without really thinking it through. INTJs are very good at recognizing a gimmick when they see it, but they do enjoy analyzing the tools being used in order to see if they are working. INTJs want to learn about different things and want to be capable of understanding just about everything they see. For them paying attention to certain gimmicks and how effective they are on people, can be a useful resource. While INTJs become agitated when someone tries to push a gimmick onto them, they simply find a way to avoid this person or situation. Most of the time they see how these things can be utilized and are interested in learning more. ENTJs are often business minded people and so they realize that certain sales tactics like gimmicks can be useful sometimes. They aren’t personally fooled by them most of the time, they simply enjoy looking into how they work and want to understand how they can use gimmicks if they need to. ENTJs believe in efficiency and so they want to do whatever they can to get the job done to their own high standards. Sometimes this could mean utilizing gimmicks in order to convince people of something they want. INTPs are rather aware people and they are good at recognizing ploys or gimmicks. They do become a bit annoyed when they notice these things, and want to avoid being around anyone who falls into them so easily. INTPs realize when something is just a gimmick to boost sales or attention, and most of the time this can feel insincere and like they are trying to fool people. They also realize that certain tools like this can be useful, but they prefer when they aren’t going to be harmful or overly deceitful to others. ENTPs recognize gimmicks but they also understand that sometimes they are useful. They dislike gimmicks which try to make people look dumb or force them into things which might not be good for them. When it comes to using gimmicks to draw attention to a business or product, they are perfectly aware that these things can be useful and often want to learn how to utilize it themselves. ENTPs aren’t completely averse to gimmicks, as long as they aren’t harmful or completely shady. ISTJs don’t like gimmicks most of the time, since they prefer things which are direct and to the point. Whenever something uses a smokescreen to grab attention the ISTJ can become rather annoyed by this. They prefer when the truth is laid out in the front of them so that they can make an informed and practical decision. For the ISTJ gimmicks are simply an annoyance which leaves them feeling distaste towards a person or company. ESTJs really don’t like gimmicks and can become rather frustrated by them. They prefer when things are direct and to the point, and don’t have all sort of smokescreens and gimmicks to draw attention. ESTJs are capable of making informed decisions and when they have someone trying to oversell to them, it makes them want to avoid this person and product even more. For the ESTJ gimmicks are distasteful, even though they realize why people use them. ISFJs definitely don’t appreciate gimmicks but they don’t always recognize them. They can be so focused on moving forward and getting things done that they don’t always notice when something is a gimmick. They simply try to make the right choices for their loved ones and care about being able to provide for them. ISFJs might not recognize a gimmick if it is well hidden, but they don’t often care much as long as they still get what they want from the situation. ESFJs often realize gimmicks are used to sell things, but sometimes they can become annoyed by them. They don’t like feeling as if someone is trying to control them and so in these instances they might find themselves getting angry. They sometimes do this in a way that seem over the top to others, but ESFJ simply prefer things which are upfront and direct. Honesty is often more important to them than people realize, and gimmicks can feel dishonest. ISTPs don’t really care about the use of gimmicks, they simply go with what feels right and makes sense to them. They understand that these are often used to promote businesses and they can appreciate the intentions. ISTPs look at the facts of a situation and do their best to make an informed decision instead of allowing themselves to fall into ploys and gimmicks. ESTPs do try to focus on the facts and don’t want to be someone who falls into gimmicks. There are times when they can become so focused on the present moment that they do fall into these gimmicks, simply because they become inspired or excited about something. When the ESTP really wants something they go after it, and sometimes they throw caution to the wind in these situations. ISFPs follow their emotions and go with what feels right, and so sometimes this does cause them to fall into gimmicks. This simply happens because the ISFP wants to experience something without having to spend a long time overthinking it. For them gimmicks aren’t all that upsetting, as long as they aren’t doing anything which harms others. For the ISFP if the gimmick lacks sincerity and seems cheap or shady, they can become upset by it. ESFPs don’t really care if something is a gimmick, as long as they are excited by the product. They go after what they want and don’t like feeling restrained or held back by rules. When the ESFP is inspired and excited about something they want to dive in and don’t feel like wasting time or energy analyzing the situation and considering whether or not it is a gimmick. ESFPs would rather live their lives following their hearts than become skeptical and obsessed.